BBI Chairman Peter Blanck, left, meets with Ecuadorian President Lenín Moreno on Jan. 14, 2019. Moreno has used a wheelchair since he was shot in a robbery attempt in 1998. On Jan. 14, Syracuse University Professor Peter Blanck, chairman of the Burton Blatt Institute (BBI) and the Global Universal Design Commission (GUDC), met with Ecuadorian President Lenin Moreno, the first lady and Ecuadorian ministers to develop collaborative programs toward an inclusive country for Ecuadorians with disabilities. Blanck also presented to the Ecuadorian and Quito City governments the first recognition in Ecuador of GUDC principles for universal design (UD, aka “Design for All”). 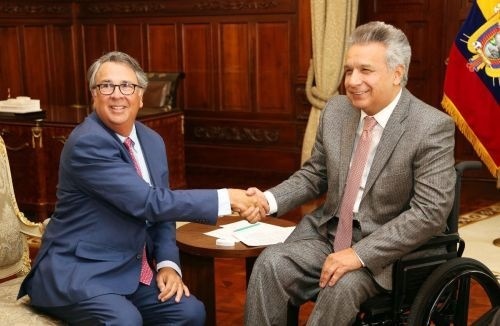 “It is a great privilege and honor on behalf of BBI and the GUDC to acknowledge the world leadership of President Moreno and many others in Ecuador to further the inclusion of people with disabilities into society,” Blanck says. GUDC is a not-for-profit corporation established to develop Universal Design (UD) standards for buildings, products and services. GUDC is developing UD voluntary consensus standards for commercial and residential buildings, which will expand access to buildings for all people, regardless of physical stature and varying abilities. BBI and GUDC have longstanding ties in Ecuador. Ecuadorian Ambassador to the United Nations Luis Gallegos Chiriboga is honorary chairman of the GUDC Board of Directors, and Ecuadorian leader Maria Teresa Donoso is a GUDC representative. While in Ecuador, Blanck also will meet with Ecuador’s Minister for Total Life, which oversees inclusive services for persons with disabilities, older adults and children, and with Xavier Torres, president of the Ecuadoran National Council for Equality of Disabilities. Torres is a leader of disability rights in Ecuador and was representative of Ecuador and Latin America for the UN Committee for Surveillance of the Convention on the Rights of Persons with Disabilities. On Jan. 18, Blanck will give a public address to celebrate the opening of the Metropolitan Convention Center of Quito, the first GUDC-certified building in Ecuador and Latin America. During this visit, Blanck will discuss future collaborations among Ecuador, BBI and GUDC with Minister of Tourism Rosy de Holguin, Quito Secretary of the Environment Veronica Arias, and former Quito Mayor Paco Moncayo.